Sicilian Gene­alo­gy & Heraldry. The only book ever pub­lished about Sicilian family history re­search is now available from Amazon and other vendors. Histori­ography, folk customs, religious practices, research strategies, records to consult. 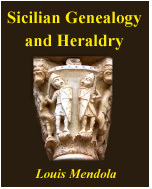 A definitive guide to Sicilian genealogy and a Sicilian identity. (300 pages on acid-free paper, ebook available soon) Read more. By definition, the peerage was the part of the collective Sicilian nobility entitled to vote in parliament, particularly after the abolition of feudalism in 1812. In the Kingdom of Sicily the Peerage and Chamber of Peers were loosely based on the British model. Just as not all Scots barons were peers (many were feudal barons) permitted seats in the House of Lords, not all Sicilian barons were entitled to seats in Sicily's Chamber of Peers. If the Magna Carta could be said to have kindled the development of England's Parliament after 1215, the War of the Vespers might be said to have forged the conditions necessary for parliamentary development in Sicily after 1282, notwithstanding Emperor Frederick II's so-called "parliament" held at Messina in 1234. Nevertheless, the analogy is a tenuous one, and in considering the Sicilian parliaments we must distinguish between genuine parliamentary assemblies on the one hand, and mere baronial convocations on the other. In 1295 and 1296, a "parliament" was convened by Frederick, the younger brother of King James of Sicily - both being sons of King Peter of Aragon. At this session, the Sicilian baronage nominated Frederick, who was Sicilian by birth and upbringing, as their sovereign, and crowned him at Palermo the following year as Frederick III of Sicily. His elder brother objected but could do nothing to alter the course of events. This was an early example of the importance of the assent of the people, or at least that of the baronial faction, in determining who would rule Sicily. The "parliament" of 1295 also established the precedent that in Sicily this entity, which never became a legislative body in the truest sense (for the Kingdom of Sicily never became a genuinely constitutional monarchy) met only occasionally, usually when political circumstances required action on the part of the feudal nobility. More often than not, these circumstances were rooted in conditions prompted by matters such as head taxes that the feudatories sought to avoid rendering to the Crown. With a few prominent exceptions, such as the brief reign of Vittorio Amedeo of Savoy early in the eighteenth century, "home rule" was to be virtually unknown in Sicily after Frederick's death four decades following the first parliament he convened at Palermo. Nevertheless, that first Sicilian Parliament was remarkable; it required Frederick to grant a "charter of liberties" remarkably similar to Englands Magna Carta in which he agreed not to leave Sicily or declare war without the assent of the feudatories, and further agreed to summon a parliament annually thereafter (though this last concession was rarely put into practice). Even in the thirteenth century, it seems, some of the lessons of Magna Carta were not lost on peoples far beyond the shores of Britain. However, some Italian historians, notably Antonio Marongiu, suggest that the "curia" of Frederick III was more akin to a crowded royal court than an actual parliamentary body. The principal parliaments held before the reigns of the five Bourbon rulers of Naples and Sicilies (the Two Sicilies) took place in 1474, 1478, 1481, 1514, 1541, 1556, 1585, 1588, 1595, 1609, 1612, 1615, 1630, 1636, 1642, 1650, 1668, 1680, 1690, 1698, 1707, 1714, 1720, 1724, 1725, 1728, 1729 and 1732. During the seventeenth century, there emerged three houses of Sicily's parliament. The clerical chamber comprised bishops and feudal abbots. The feudal chamber included "peers," who were usually greater feudatories (i.e. their fiefs were towns rather than smaller hamlets or farms), and the demesnial chamber consisted of representatives of "demesnial" cities and towns (Palermo, Messina, Catania, Castrogiovanni, Calascibetta, Vizzini, etc.). "In Sicily, all the holders of simple fiefs bore the title Baron, and in the various investitures of the same fief the title holder was indiscriminately referred to as Seigneurial Lord (Signore) or Baron (Barone)." Thus the meaning of pari, like that of barone and cavaliere, was often based as much on context and usage as on heraldic law. King Carlo de Bourbon (di Borbone) addressed a Sicilian Parliament in 1735 following his coronation as King of Sicily. Important parliamentary sessions followed in 1738, 1741, 1746 and 1786. The last important parliaments convened in Sicily coincided with the establishment of constitutions in 1812-1813 and 1848. It was actually the proposed abolition of feudalism in 1812 that prompted a session beginning in that year, though the peers could not prevent the King's abrogation of this age-old institution. Parliament was seen by many as the Crown's attempt to preserve some rights of the nobility when feudalism no longer existed, though the revolutions of 1848 were sufficient cause for a session in that chaotic year. During the nineteenth century, Peers of the Realm were chosen from among those noblemen whose predecessors had held parliamentary seats before 1812, or who themselves held greater feudal rights at the time of the abolition of feudalism in that year, or whose taxed assets exceeded a certain level of wealth. Excluded were those noblemen whose minor feudal rights were connected with the purchase of feudal property during this period Therefore, dozens of "minor" baronial families such as the Guccia and Mantegna did not hold seats in the parliamentary session of 1848, whereas the Lanza, Notarbartolo, Paternò and Alliata did. Families whose titles, in the absence of male heirs, had passed to an heiress, were not represented in parliament. As we have seen, the assent of the greater nobility was required for a King to rule over Sicily, and though this practice had evolved considerably by the revolutionary year of 1848, when the last Parliament met (one was called in 1860 but was never officially convened), it is interesting to consider that the heirs or other members of many of these peerage families have retained ties with the Sicilian Royal Family (today the House of Bourbon of the Two Sicilies) as knights of the dynasty's Constantinian Order of Saint George. In the following list, the title which was the basis of the right to a single vote in parliament is indicated in the left margin, with the name of the family indicated to the right. Though the names of some of these feudal localities, which represent but a fraction of the "Thousand Cities" of the Two Sicilies, have changed, others will be familiar to those who have travelled across Sicily. Only two territorial designations contain surnames, namely Spadafora and Villasmundo (the Asmundo family). Certain peers, who may have had feudal rights to more than one locality, were entitled to more than one vote. Indeed, in the eighteenth century there were several instances of feudatories founding localities (typically by dividing a large town) in an attempt to procure for themselves additional votes; such was the case with San Giovanni Gemini, which was previously part of Cammarata, though by 1848 this was no longer a peerage title. To have been a Peer of the Realm in Sicily meant little after 1860; the Senate of the Kingdom of Italy became the upper house of the new unitary state, and though many senators were noblemen senatorial seats were not assigned exclusively on the basis of blood. Italy's Consulta Araldica (College of Arms) did not recognise Sicilian "peerages" even as honorary titles, though it recognized the nobiliary ranks on which these peerages were based. Much more could be written about the Sicilian parliaments and peerage, such as the former being influenced in 1812 by the British model, the role of feudalism in shaping these institutions in Sicily, and the comparative history of parliaments in various Italian regions (as well as the Piedmontese influence on the session of 1714). For those interested in this topic, the author recommends several works cited at the end of this article, which make reference to various documents that may be readily consulted at the Archive of State in Palermo. In the original Italian the decree defining barons reads: "In Sicilia tutti i possessori di feudi portavano il titolo di Barone, e nelle diverse investiture dello stesso feudo il titolare era indifferentemente qualificato Signore o Barone." Brancato, F. L'Assemblea Siciliana del 1848-1849. Florence 1946. Calisse, C. Storia del Parlamento in Sicilia dalla Fondazione alla Caduta della Monarchia. Turin 1887. Genuardi, L. Il Parlamento Siciliano. Bologna 1924. Marongiu, Antonio. Il Parlamento in Italia. Milan 1962. The Author: Luigi Mendola, the author, is one of the world's foremost experts on Italian heraldry and feudal history. ©1998 L. Mendola. Published by permission.